The show link is here – http://www.bbc.co.uk/programmes/b061xxhq – have a listen to the whole hour, it’s fascinating. “…you have to trust each other, you have to have the belief that what the other person is going to bring to the music is better than what you would do on your own. Otherwise you’re just going to resent them. I mean, that would be terrible, improvising with someone who was messing your music up! So you have to have that feeling – and commit to that feeling – that what they’re going to bring is better than what you would do on your own… and then leave room for that. “and so one of us might start… I mean, sometimes we’ll just sit there and giggle at each other for a minute before we start because neither of us want to, and both of us want the other to lead us into something new. 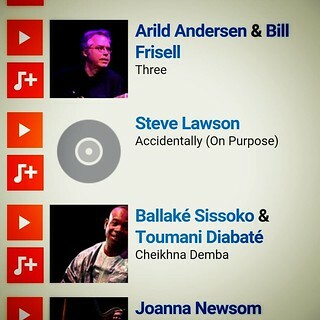 It’s an inspired bit of radio programming, given what a massive influence on me both Bill Frisell and Arild Anderson have been, and what an influence Toumani Diabate has been on Daniel… Top work, Fiona! And given that the track that followed ours was by Ballaké Sissoko and Toumani Diabate, it’d be fitting to link here to Daniel’s amazing acoustic Kora work too.